I have been teaching Middle School for seven years. Despite the low pay and long hours, I wouldn’t trade this career for anything! My teacher education program taught me to have all my lesson materials prepared, but no one ever schooled me on the other essential teacher must-haves, like a tumbler that will keep my morning coffee hot until lunchtime, or the best shoes for teaching! Standing and moving on your feet all day takes a serious toll on your heels. It can cause pain and discomfort that spreads to the ankles, the legs, even the hips or lower back. I know from experience. My first year teaching was exhausting – mentally, emotionally, but also physically. By Christmas break, I was suffering from aching feet and back pain. I knew I had to turn things around because my aching body was making me crabby and cramping my teaching style. I received a special pair of shoes for Christmas that year and I’ve been wearing them ever since! In this guide, similar to the Best Tablet for Reading by the Fireside this Fall review, I’ll share my picks for the best shoes for teaching. Teaching is already a tough job, but you make things easier by feeling (and looking) your best with the best shoes for teaching. Clarks Unstructured Women’s Un.Loop Slip-On Shoes are my ride-or-die, absolute best shoes for teaching. I don’t have completely flat feet, but I definitely need some cushion in my shoes to survive the day. Clarks Unstructured Women’s Un.Loop Slip-On Shoe has the softest cushioned heel and collar. Not only do I not feel discomfort after wearing them for hours, my body actually feels better than before. I really think wearing my Clarks Unstructured Women’s Un.Loop Slip-On Shoes actually helps to improve my posture as I stand at my whiteboard for hours. Plus, can you really put a price on your physical well-being? You have probably spent a pretty penny on a comfortable mattress because you sleep on it every night and you need a good nights rest. I truly feel that these shoes are worth the investment since they keep me calm and comfortable almost every work day. In my early teaching days, I was still concerned about workplace fashion (eye roll). Pointy flats, ankle boots, even heels were in my weekly rotation. It’s no wonder I didn’t collapse at the end of the day! I did, however, develop blisters and a bad attitude. When I started wearing my Clarks Unstructured Women’s Un.Loop Slip-On Shoes, it was like I had a revelation – shoes can feel like this?! They were the best shoes for teaching then and still continue to be the best shoes for teaching now. You can wear them with or without socks (its personal preference really). The Clarks Unstructured collection features climate control technology built into every shoe. The Air Circulation System (ACS) uses flexible, lightweight material that allows fresh air in and vents out warm, moist air. Your feet will not sweat or overheat. They’ll be dry and comfortable from breakfast until the dismissal bell. Clarks has been in the shoe business a long time and designs for real customers. They know that everyone’s feet are different. That’s why the Clarks Unstructured collection includes shoes in half sizes, medium, and wide fit sizes. You are sure to find a size and shape that is perfect for your foot. Teaching is tough, so your shoes have to be tough too! Clarks Unstructured Women’s Un.Loop Slip-On Shoes are designed with a sturdy 3.5 cm rubber sole that won’t scuff or mark. The upper and outer parts of the shoe are constructed from genuine leather that is made to last. Day in and day out, these shoes will stand the test of time. With a removable OrthoLite® cushioned footbed, wearing the Clarks Unstructured Women’s Un.Loop Slip-On Shoes feels like walking on clouds. Let’s be honest, teachers don’t just stand all day. We bend, crouch, stretch, climb stairs, even run on a daily basis! I love how these shoes absorb the shock and stress of any movement, keeping my feet feeling comfortable and healthy. One unexpected pro is that the ultra-comfortable Clarks Unstructured Women’s Un.Loop Slip-On Shoes are also pretty stylish. Mine are solid black. The genuine leather material gives them a timeless look. They can be dressed up or down. I wear them on jeans day or with a skirt and blouse. It’s definitely more professional looking than wearing tennis shoes and more youthful than sporting orthopedic shoes. One con of the Clarks Unstructured Women’s Un.Loop Slip-On Shoes is that it has no lace, zip or buckle feature that would allow you to adjust the fit of the shoe. This is a flaw but not a deal breaker. Its simple slip-on design is sleek and effortless. The Sperry Top-Sider Women’s Angelfish Slip-On Loafer is my runner-up for best shoes for teaching. Originally designed for boating, these light and classic shoes also fare well in the classroom! Sperry shoes have a cult following — and for a good reason. Their loyal customers (not just seafaring boatmen) know that every shoe in the Sperry collection will conform to your foot for incredible comfort. I love my Clarks Unstructured Women’s Un.Loop Slip-On Shoes, especially during the fall and winter months. But in spring, I just need a shoe that is light and preppy, hinting that summer break is coming. Enter the slip-on loafer. The Sperry Top-Sider Women’s Angelfish Slip-On Loafer is my second favorite shoe for teaching. I can wear them all day in the classroom and keep them on for soccer practice after school. The inner fleece lining is thin and so soft, which protects feet from rubbing or blistering against the shoe. The tongue of the loafer is also comfortably padded. The material is breathable throughout, so my feet don’t sweat or overheat in my hurry to pick up my class from lunch on time. The Sperry Top-Sider Women’s Angelfish Slip-On Loafer is designed for all-day under-foot comfort. It includes a molded EVA Cushion Midsole. I tell you, it is like a pillow for your feet. Whether you have flat feet or a strong arch, the cushion will conform to your unique foot shape to support you properly. Premium leather and genuine handsewn construction make these shoes incredible to look at and incredibly practical to wear. For starters, they match almost anything! Next, considering how many times a student accidentally spilled something on my shoes, you would never be able to tell. The Sperry Top-Sider Women’s Angelfish Slip-On Loafer easily repels liquid. No worries about accidents or mess in the classroom. The Sperry Top-Sider Women’s Angelfish Slip-On Loafer also has a great secure fit system with 360-degree lacing. You can adjust it so that the loafer feel secure, but not too tight. Also, the eyelets are rust proof. Sperry has thought of everything! In the classroom, durable clothing is all important. Whether there’s a fire drill, a staff-student dodgeball game, or science experiment, your shoes have to be ready for action. The Sperry Top-Sider Women’s Angelfish Slip-On Loafer is both stain and water resistant. Mine have been worn for years and look good as new. In addition, their excellent wet/dry traction makes them super safe. The non-marking rubber outsole with wave-siping (TM) will keep you from falling or slipping. It doesn’t wear or thin and is built to last. When it comes to shock absorption, the Sperry Top-Sider Women’s Angelfish Slip-On Loafer is unparalleled. It was originally designed to absorb movement and shock from waves rocking a boat! No matter your movement, Sperry Top-Sider Women’s Angelfish Slip-On Loafer expertly absorbs the shock so that your body doesn’t have to. One con of the Sperry Top-Sider Women’s Angelfish Slip-On Loafer is that it has limited sizing options and may not fit well on wide feet. The design of the shoe is rather narrow. Although the leather is flexible and will conform to the shape of the foot, it still may be uncomfortable for some. The pros of these shoes are numerous: high-quality materials, hand-sewn construction, great look, and long-lasting durability. If you want to feel and look amazing, Sperrys are a fabulous shoe for teaching. Dansko Alberta Collection Women’s Alissa Fashion Sneaker is another excellent option for best shoes for teaching. The Dansko name has become synonymous with comfort. They have a wide variety of styles, including open-toed sandals, boots, and pumps, but this one is my personal favorite. Many shoes brag about having an EVA insole, but this sassy Dansko fashion sneaker has an EVA injected outsole. Dansko takes comfort seriously and is always pioneering new technology and designs that take things to next level. Dansko Arch technology is used in the removable molded footbed. The sneakers feature a lightly cushioned tongue and collar and are constructed from breathable fabric linings. Veteran teacher colleagues of mine swear that they can wear them in our building with no air conditioning and still have dry, cool feet! These are not your average sneakers. Obviously, you expect an athletic style shoe to be supportive, but Dansko uses advanced technology to provide a high degree of support. The Women’s Alissa Fashion Sneaker features a removable, contoured, and fully-cushioned footbed for all-day comfort. The Dansko Alberta Collection Women’s Alissa Fashion Sneaker is perfect for functional everyday wear. It’s the only shoe on my list that laces up, allowing you to tighten or loosen and adjust the fit perfectly to your foot. Its beautiful neutral leather can match just about everything. These smart sneakers even have 3M Scotchgard protection (so you can wear them out to recess without worrying about stains). Teach actively without fear of wearing down your shoes. The Alissa Fashion Sneaker has a streamlined but ruggedly durable rubber outsole. The vulnerable outer places are protected with nylon shank. You can jump into each and every day of teaching ready to go with these durable sporty fashion sneakers. If you’ve ever landed on your heel the wrong way and felt the shooting pain run up your foot and into your ankle, you know how important shock absorption is. An incident like that can throw a wrench in your entire day! 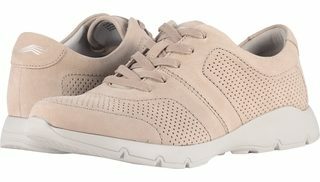 Dansko Alberta Collection Women’s Alissa Fashion Sneaker has a compression-molded midsole that is lightly cushioned for added shock absorption and support. Feel safe and secure in these classy sneakers. I love a good-looking fashion sneaker but fell in love with these because of all the details that went into the comfortable design (it’s like they were made with teachers in mind). Being able to adjust for a secure fit with laces is another pro. If that isn’t enough, the Dansko Alberta Collection Women’s Alissa Fashion Sneaker comes in five color options. The one con is that it is a sneaker, which is really only a con if it is against your staff dress code. Although this smart looking leather sneaker can certainly pass for a professional look, my colleagues wear theirs with dress pants and slacks all the time. Your students don’t care what you look like. What matters to them is energy and fun. You can’t have either if you aren’t truly comfortable. But what exactly should you look for in a shoe? A quality comfortable shoe includes a few key things: a firm sole that doesn’t easily twist or bend, a cushioned heel, and flexibility at the proper areas depending on the type of shoe. For the upper of the shoe, a soft breathable material makes it effortless to wear for hours at a time. Soft material is also less likely to cause rubbing or skin irritation. Opportunity for adjustment (laces, straps, and buckles) is a preferable feature to have in the upper of the shoe. This way, you can enjoy physical activity during the school day with your foot comfortably held in place. There should definitely be some arch support in the shoe. Rather than trying inserts, go for shoes that feature a quality insole. What part of the foot needs support and how can you support it? Arches take in the brunt of the pressure our bodies force on our feet with each step. The arch is the most important structural feature of our feet. They carry thousands of pounds of stress for each mile we walk! The height of your arch may be very different than that of another individual. It can also change as you age, making shoes that once felt fine feel suddenly unbearable. Correctly supporting your arches while you teach can prevent a variety of muscle and skeletal problems that can lead to pain and inactivity. Support for the Metatarsal Arch: When you must be on your feet for extended periods of time, the balls of your feet are bound to ache. Good support for the secondary arch of the foot will prevent this problem. Soft, Deep Heel Cup: All insoles should have a good, deep heel cup to provide effective shock absorption. Layers of Cushioning: Good cushioning helps prevent foot fatigue when you must be on your feet for many hours and/or when you must walk or stand on hard surfaces. Extra cushioning also helps provide stability and alignment. Firm Arch Support: Good support for the arch is key to preventing pain in the heel. Arch support designed to prevent or treat plantar fasciitis may feel too high initially, but it is important that the arch support make full, firm contact with the arch of the foot in order to provide relief of pressure on the heel. Incorrect alignment puts stress and strain on the body (like you need any more of that!). With good support in the shoe, body alignment can be corrected and posture improved. It’s like that special feeling when you catch a second wind. 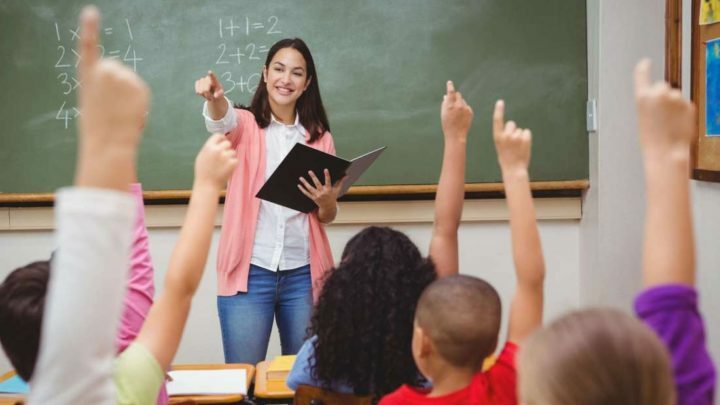 Teach with more energy than ever before! What is shock absorption and why is it important for teaching shoes? Technically speaking, the purpose of shock absorption is to eliminate the incredible amount of kinetic energy that your body takes in with each step. Foam and EVA cushioning can significantly lessen the force of impact delivered from your heel up the kinetic chain to other lower body joints. The right footbed can provide important protection for the entire body in a way no other shoe can. Proper design will absorb painful shock from the ground up, changing the shock into positive momentum and energy for your next step. You’ll have no trouble at all keeping up with kindergartners! Consider long-term benefits too. Truly effective shock absorption can help prevent conditions such as arthritis and Plantar Fasciitis. The best teaching shoes are crafted from quality materials. 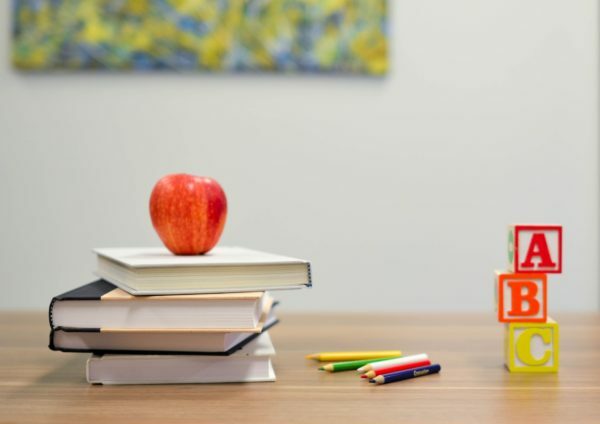 Every teacher knows that it’s worth investing in a quality industrial pencil sharpener because you’ll count on it to function properly every day — it’s essential! The same can be said for teaching shoes. You’ll need them for the 8 hours you spend on your feet, every day. 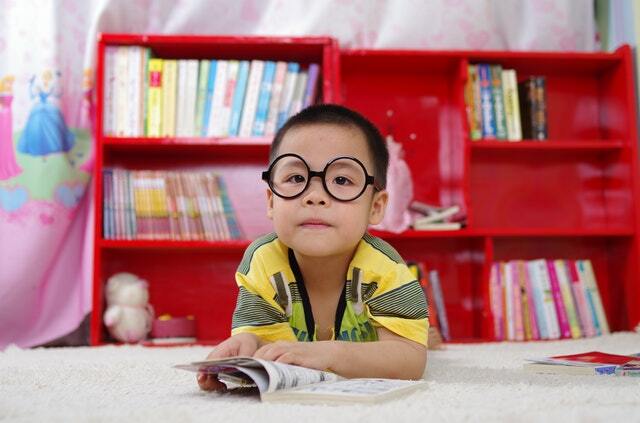 Well made shoes with exemplary materials will withstand the wear and tear of your school routine. I highly recommend water-proof material. The leather is great for conforming to the shape of your foot, and non-marking soles are a must. The best teaching shoes should last you years. Seeking out the best shoes for teaching is a worthwhile endeavor. You are making an investment in an item that can completely transform your experience in the classroom. When your shoes are comfortable and supportive, you will be at your best. Energy and positive results will come naturally. 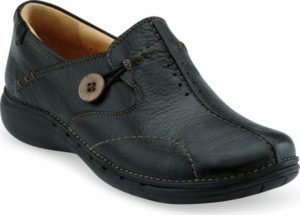 Clarks Unstructured Women’s Un.Loop Slip-On Shoes are my absolute number one choice for best teaching shoes. Their ortho-lite footbed makes me look forward to wearing them every day, and their simple style pairs perfectly with any outfit. Consider these best teaching shoes an essential piece of your teaching toolkit! All the of the shoes featured in this review are high-quality options, and your choices don’t end there. The key is to look for true comfort by finding shoes with support, shock absorption, and quality materials. If you follow this guide you can’t go wrong! Q: Is it bad to have a low foot arch? A: A foot with a low arch usually sits low to the ground and has a little definition, but is flexible. Low arched feet tend to roll inwards. Typically, imprints or scans for your foot type show almost your entire foot. Low arches are often imbalanced and can make your feet more susceptible to common foot problems such as heel pain and arch pain. The good news is that the right footwear and foot support can help you achieve proper body alignment, prevent injuries and help you maintain a healthy and active lifestyle. Q: What is an EVA sole? A: EVA material proves to be better than rubber as they are one of the best shock absorption materials available today. EVA sole is anti-vibrant with good tensile strength and shock cushioning with high toughness. They provide insulation towards cold temperatures. Q: How do you take care of Clarks? A: To clean leather Clarks: Use Clarks Water and Stain Protectant before wearing them for the first time. Spray the full leather exterior of the shoe. For shoes that have already been worn, apply Clarks Leather Polish with a dry rag and allow to dry for 30 minutes to clean, polish, and moisturize the leather. Q: Do Danskos have a lifetime warranty? A: Dansko does not have a lifetime warranty. But they do guarantee their footwear from manufacturers’ defects within a reasonable amount of time and wear. Normal or abnormal wear and tear is not considered a manufacturers defect. This entry was posted in Friday Feature, In Depth Product Reviews, Personal Care and tagged shoes for teaching. Bookmark the permalink.